Free Convert Pdf to Website Html Converter is a professional pdf and Website Html conversion tool. It can batch convert pdf to webpage htm html with high quality. Advance Features Easy to use. Do the conversion only with 3 steps. High-quality, High-efficiency, High-speed. Separate convert one multi-page file to multi-file. Combine convert multi-file to one multi-page. Convert various format file to one format once. Choose adding the watermark of image conversion. More parameters to control to output doucment, image, flv and swf. System Requirements 1G Mhz Pentium ll CPU or higher. 256 MB RAM Memory or higher. 100 MB free hard drive space. Windows XP/2003/Vista/win7/win8. Microsoft-office2000-2007 version, or higher. Adobereader 7 or highter(pdf conversion need). IE 6.0 or higher. HTML5 Movie Maker is the all-in-one solution to convert all video file formats to HTML5 compatible OGG, MP4, WebM video formats to play on websites with any Web Browser and Mobile devices. Browser support: Internet Explorer 9+, Firefox 4.0+, Google Chrome 6+, Apple Safari 5+, Opera 10.6+ Mobile support: iPhone 3+, iPad 1, 2, Android 2.1+, Blackberry 6+, Windows Phone 7+ With HTML5 Movie Maker, you can create stylish web player with your favorite skin control bar. The versatile editing functions enable you adjust video output effect and resolution, crop video size, rotate & flip video, add business watermark and advertisement, etc. 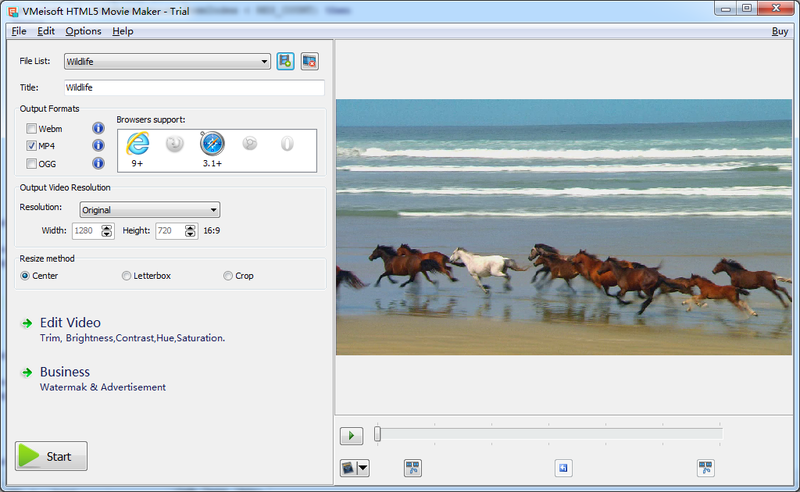 Key features of HTML5 Movie Maker Support for almost all SD and HD video formats. Support to convert AVI, WMV, MP4, MOV, MPG, MPEG, MKV, FLV, VOB, DV, M4V, 3GP, 3G2, RM, RMVB, ASF, DAT, M2T, TS, MTS, M2TS, TOD, MOD, etc. Convert to 3 HTML5 supported video formats for different browser Mp4=MPEG 4 files with H.264 video codec and AAC audio codec Ogg=Ogg files with Theora video codec and Vorbis audio codec WebM=WebM files with VP8 video codec and Vorbis audio codec Compatible well with main Browser Support Internet Explorer 9+, Firefox 4+, google Chrome 6+, Opera 10.60+, Apple Safari 4+ Work smoothly on popular mobile devices iPhone 4S/4/3GS, iPad, iPad 2, the new iPad, iPad Mini, Samsung/Motorola/HTC/LG Android phone, BlackBerry, Windows Phone, Nexus 7, Samsung Galaxy Tab, etc Customize web player Customize the web player with your favorite style of player skin control bar. Edit HTML5 video Effect: Adjust video effect such as brightness, contrast hue, and saturation. Crop: enter height, width, left and top values to set the size and the position of the crop area. Rotate & Flip: Rotate video to left or right, horizontally or vertically flip video Add business watermark and advertisement Add picture watermark, adjust watermark transparency, size area, horizontal and vertical location. Insert picture advertisement with link to your website, change advertisement image size. Set web player play mode You can set the play mode as “Autoplay”, “Controls” or “Loop” according to your own preference. Html to Pdf Converter is a powerful and easy-to-use converter that is designed to free convert HTML file to PDF document. Just specify a html/htm, it will directly convert it to a PDF document with professional quality and fast processing speed. It is standalone software, Adobe Acrobat Reader is NOT required. Advanced features: Support local html,htm. Simultaneously convert massive html files to PDF once to save time and energy. Do not need any printer driver and Adobe Acrobat, Acrobat Reader etc software. Provide more detailed parameters settings to customize PDF page. Provide watermark image settings and watermark character string settings. Key features: Support PDF margins. Support add the entire folder to convert. User-friendly interface, very easy to use, just a few clicks can finish the conversion. Be amazed at fast conversion speed and excellent file quality. If you do not have time to convert the files of list now, you can save the converted list to your computer. Do not need to load every file again. Have the option to auto open the output folder when conversion finished. More..